At GENERAL ST PARK, the hills are perfect for slides - grassy with just-right slopes going down into the park itself. 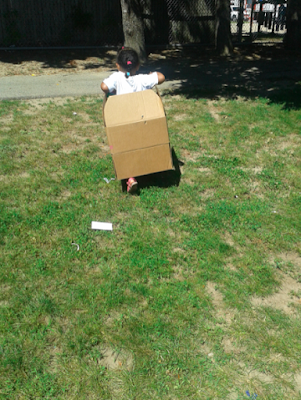 The children picked up on this right away and started using cardboard boxes as "sleds." 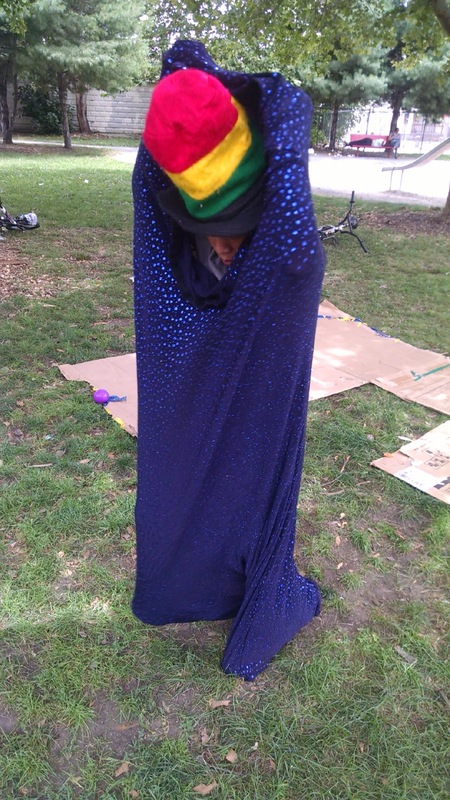 The team picked up on these play cues, and helped the kids build slides out of tarps and old banners. 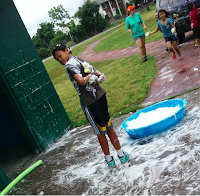 Once they added the water, they created an instant play sensation which was brought out on hot days for the rest of the summer. At WALLACE ST PARK, the team and kids created water slides on tarps spread over the ground or even on the playground slides themselves. Play Leader Tina, however, didn't anticipate the kids trying to climb up the wet slides from he bottom. Tina was nervous at first that they would slip and get hurt, or that someone would slide down on top of them. But she respected the kids' choices and let them do it. 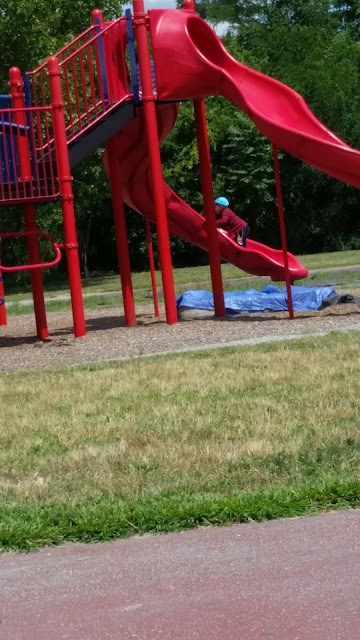 When she took a step back, she watched as an amazing 3-year-old climbed all the way up the slide and pulled herself to the top. In that moment, Tina realized that if kids don't take risks, their comfort levels continue to shrink and they become adults that are mentally trapped in tiny bubbles. 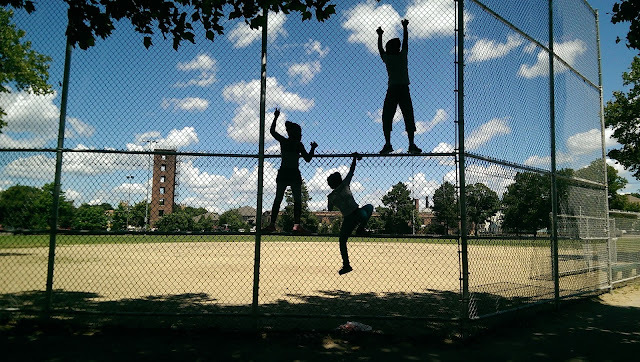 When they do take risks, push themselves and play freely, they grow into adults who are well adjusted and know how to explore their own boundaries, limits, and senses of fun. 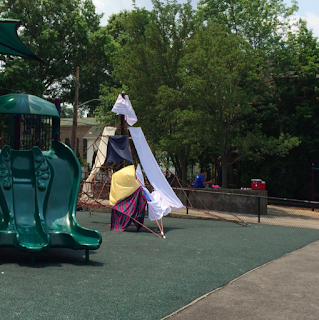 One Thursday afternoon at BILLY TAYLOR PARK, kids took the water park to an entirely new level. It was a hot day, so an older boy— who was nicknamed “Peter Pan”—recruited a following of “lost boys” to create a giant water slide. Earlier in the summer, the kids had discovered that wringing out the sponges over the slide made for a very fast and exciting ride. That day, Peter Pan decided to drag the kiddie pool to the bottom of the slide to create a splash-zone at the end. With his lost boys in tow, they filled the pool using the noodles, dragged it across to the playground, dunked themselves in the pool, then raced to the top to slide down as fast as they could. The PlayCorps team watched anxiously from a distance as the children attempted to land in the pool. Sometimes they slid too fast and would overshoot the pool. But still the team didn't intervene and allowed the children to play. The team paid close attention, noticing that when children did fall, they continued to laugh. The children also looked out for each other, checking on everyone after they took their turn, Soon the experimentation yielded a super fun and successful water slide rivaling any that one could imagine in NeverLand. 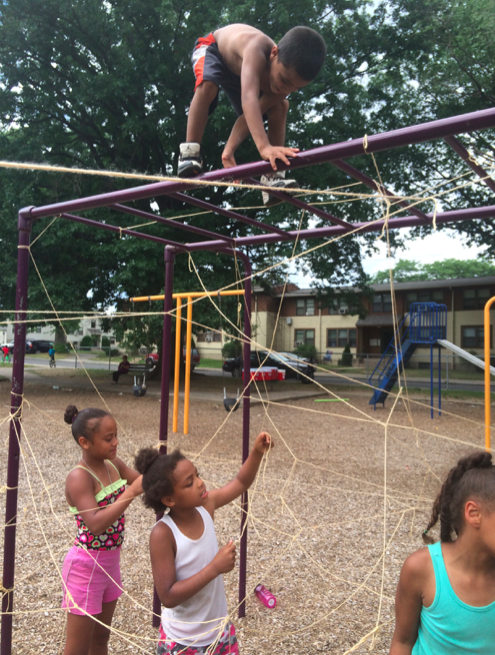 Each PlayCorps team is trained to let kids assess their own risks. That essentially means that we let children do activities that might be deemed somewhat "unsafe" in a school environment because they're fun, and because children are often better at taking care of themselves than we give them credit for. Because of this philosophy, the kids at our parks end up climbing ... on fences and trees as well as traditional play structures. Often as high as they can go. 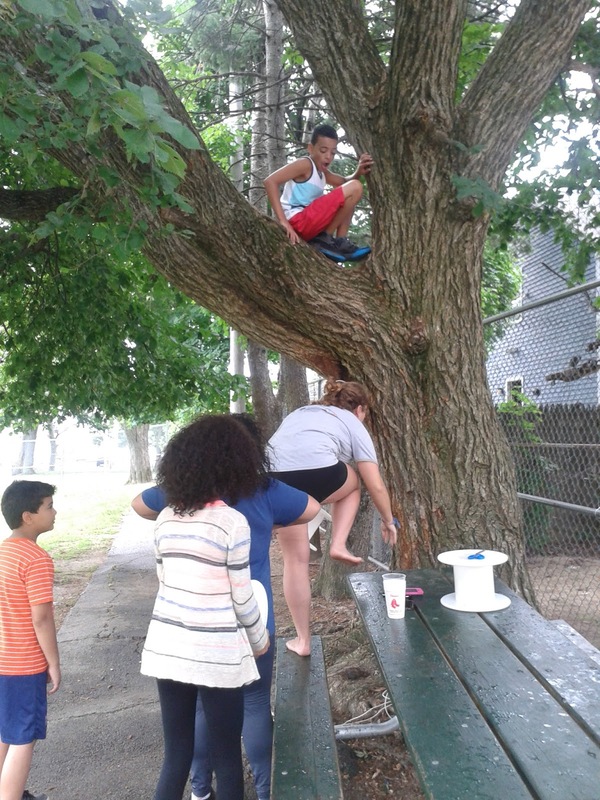 At HARRIET & SAYLES PARK, a boy we'll call "D" expressed interest in climbing a tree. The team was right there to support him. The adults around were very nervous and were questioning our boundaries, but the team reassured them that D could climb on his own and assess his own risks. When D needed it (not often), PlayCorps staff offered suggestions about where to put his foot or where to climb next. The parents stood aside and watched nervously as D climbed quite high in the tree. All the hard work paid off because D succeeded in helping to run some fabric around a high branch and secure a makeshift swing. Even the adults that had been most nervous were amazed and started to help the kids attach the a "seat" to the cloth to improve the swing. 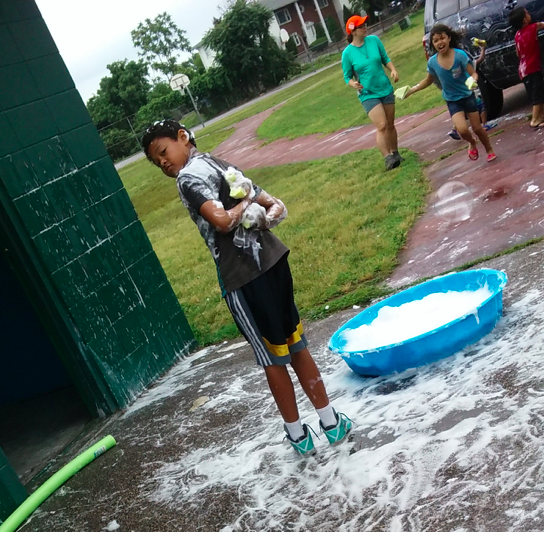 All of the Playcorps participants couldn't wait to take a turn! 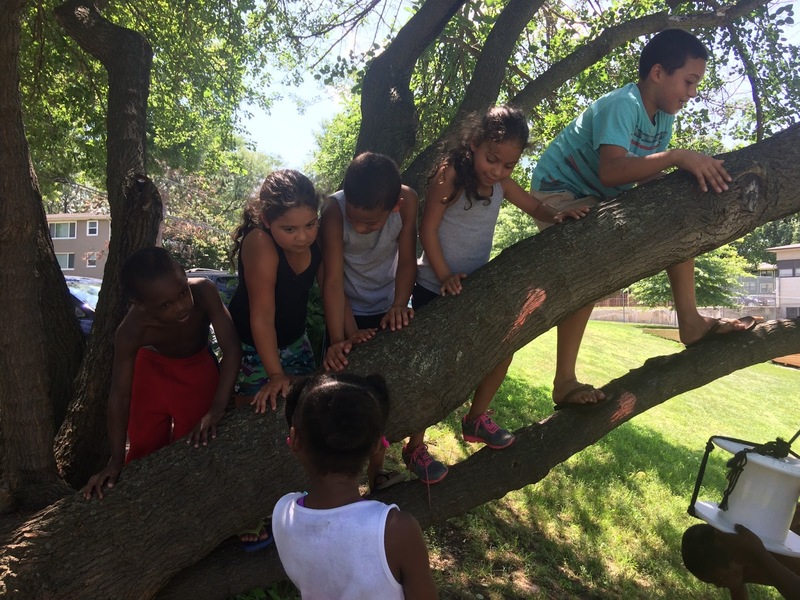 At GENERAL ST PARK, kids found similar uses for the giant mulberry tree. The team there had been encouraging any interested kids to climb the lower, more horizontal branches. Some would only go up a few feet while others, as they felt confident, went all the way to the tip of the large branches. The kids squealed in delight when the staff stood below them and shook the branches or tried to grab their feet. 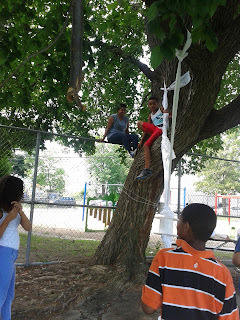 The kids at General Street also made a swing that they hung from one of the branches with the help of a particularly nimble climber. Most kids requested that an adult push them as hard as they could on the swing. 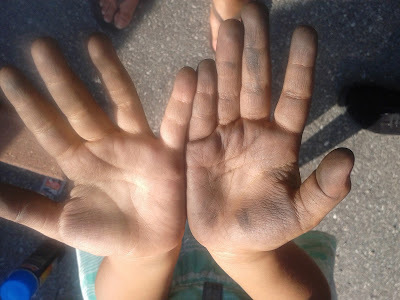 Even if they were scared, they, like all children, were adept at pushing themselves, assessing what is good play for them, and having fun – even in settings that might be deemed "unsafe" in a traditional school environment. One sunny afternoon when the Playmobile was visiting BUCKLIN PARK, one of the children thought it would be fun to climb the tall fence behind home plate of the baseball field. Other kids saw how high he was climbing and decided to join in. The adults at the park became very nervous and started to yell at the kids to come down. Playmobile Play Leader Casey assured the adults that she was watching closely and that the kids were engaging in positive-risk taking. "It's sort of like rock-climbing," she said. 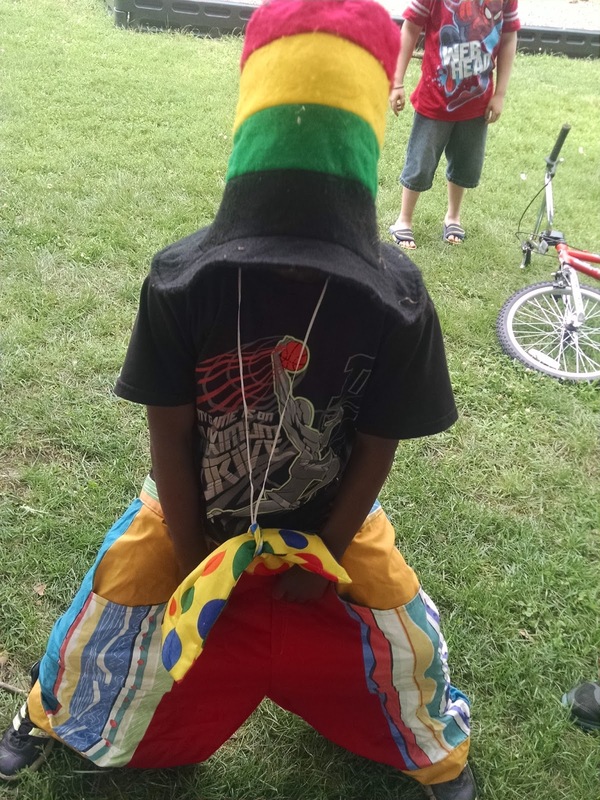 "They are engaging their motor skills, motor planning, problem solving, and building muscles while maintaining balance." An adult replied, "it's all fun and games until someone gets hurt." Though it is true that when kids engage in risk-taking there is potential for injury, there was a great deal of adult supervision and arms extended to catch their fall. Casey and Bucklin's Play Leader Monique were not worried and they encouraged the children to continue climbing. They knew not to set limits about how high the kids could climb because the kids would know instinctively how high they were comfortable going. Although it was making the adults nervous, the kids were smart climbers, had smiles on their faces and felt a sense of accomplishment when they came down, knowing they had completed a challenging task. Each PlayCorps team is equipped with, among other things, a collection of card board boxes: some large, some small. Some beat up, some brand new. Most people don't look twice at a cardboard box. At PlayCorps, however, we know the adage is true: kids often play more with the box the toy came in than the toy itself. At HARRIET & SAYLES park one day, kids had the idea to tape two boxes together. 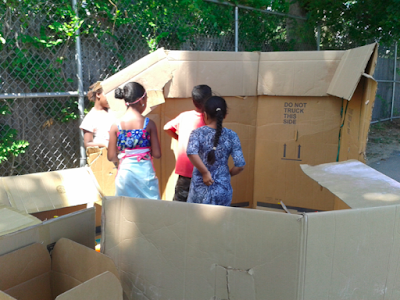 Before long, a group of kids had crafted an entire cardboard city, equipped with an "ice cream shop" that was active throughout the rest of the day. 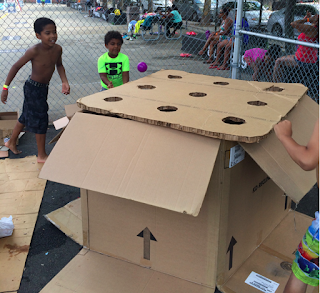 Not all cardboard play is, or should be, communal. Oftentimes, children recede into worlds of their own to play. 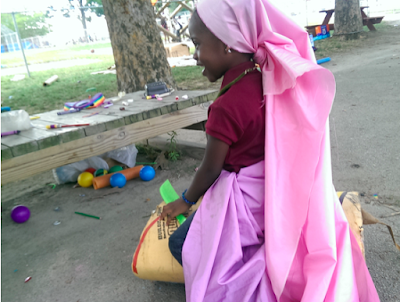 And each PlayCorps team is trained to foster individual imaginative play as well as group play. 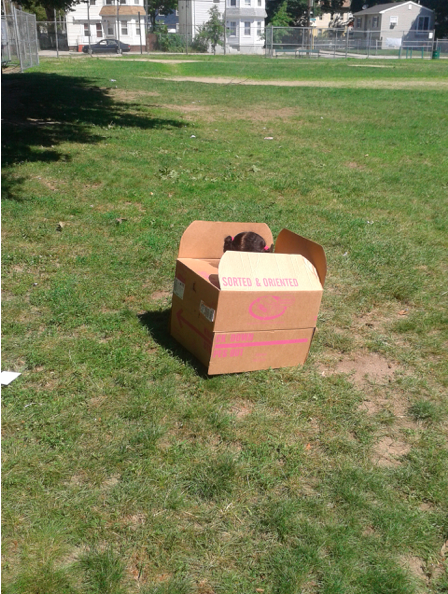 Near the cardboard city at Harriet & Sayles Park, one girl sat down decidedly inside a cardboard box. She didn’t get out. Instead, that box became her moving house. She would pick it up and walk with it still around her, or she would set it down and it would become a fixed dwelling. It became a versatile, safe space where she could explore her own fun. At PASTORE PARK, kids stumbled upon an incredible game all on their own — a kind of golf without clubs, and with cardboard boxes as the holes. Kids placed a perforated square slab of cardboard on top of a giant cardboard box, and they then attempted to toss mini colored balls into the holes on the square and into the box below. They were enthralled with the game and played it right up until clean-up time. 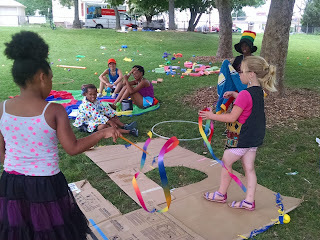 It had never occurred to the team to combine those materials into such a game, and the episode revealed kids’ capacity to not only create worlds out of boxes and objects, but also brand new competitive games with their own specific rules and goals. At CAMDEN AVE PARK, PlayCorps program manager Jillian Finkle dropped off an enormous cardboard box she was given by a local furniture store. 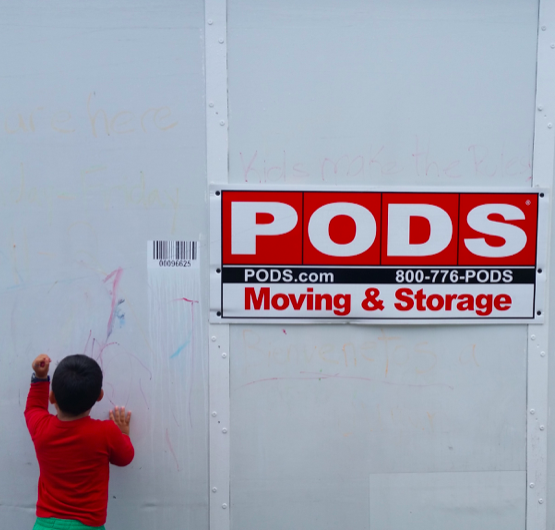 Before long, with the help of the PlayCorps team, some kids had not only turned it into the box into a huge hallway connected to a series of other box rooms, but they also started painting murals on the inside and outside of the box to which other children could contribute. These are just a few examples of everything that kids are doing with cardboard boxes in the parks every day. And it doesn't just have to happen in the park! Looking for something fun and cheap to do with your kids at home? Just find some big boxes, and let them loose! 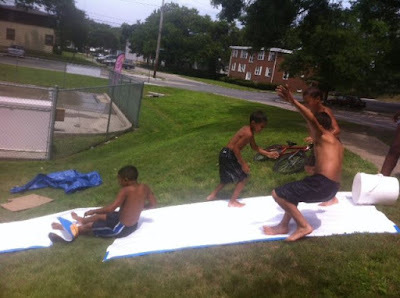 A creative homemade water slide at General Street Park! Stay tuned (and follow us on Facebook) for more photos and stories of kids at play!